The retro look of narrow neckties is a sought after look by many younger men. This group of men wears the skinny tie not as a formal piece of accessory – the traditional use of the tie. Instead, the skinny tie gets combined with jeans, and a dress shirt with rolled up sleeves and top collar open. The tie knot is also not a knot one would tie for the business occasion. When worn with casual clothes, the tie knot on the skinny tie is also more on the “laid back” side: Slightly loose, non-symmetrical, and with multiple dimples that have a closer resemblance to unwanted crinkles than a perfect tie knot dimple. Pictures above: Skinny ties in fashion, the skinny is a popular piece of accessory for many fashion designers. Most common with jeans and open “non-dressy” button up shirt shirt. The skinny necktie is quite popular for many genres of music: From alternative EMO bands like “My Chemical Romance” to pop music stars such as Justin Timberlake, the skinny tie is an often picked piece of clothing. The way the narrow tie is worn however is a little different. Alternative rock bands typically resemble more the look of the 50s combined with the “rock star” life style found in the 80s. Pop music on the other hand usually focuses more on the current collection of brand name designers. 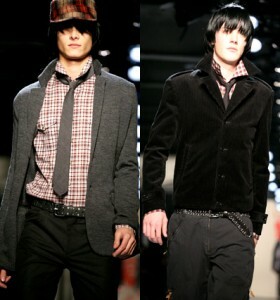 For many designers skinny neckties are part of the collection. 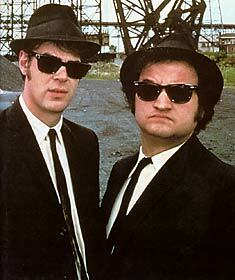 Pictures: Fall out boys (left), blues brothers (right) wearing skinny ties. Amoung celebrities, the skinny necktie has become a poluar choice for red carpet events. For traditional balack tie attire, the skinny necktie is unsuited. Instead stick with a black bow tie, tuxedo and white pocket square. Most celebrities choose the solid color black necktie either made from fine silk or even leather. 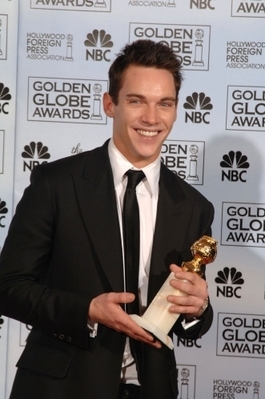 Pictures above: Celebrities wearing a skinny necktie, Jonathan Rhys Myers (left), Brad Pitt and Angelina Jolie during Golden Globe awards (right). 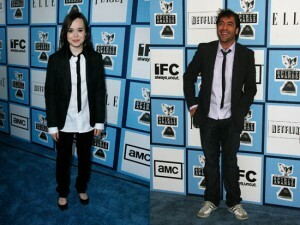 Many fashioon designers now use the men’s necktie for their women’s collections. The ties are slightly shorter to ensure they can be ties to the right length. 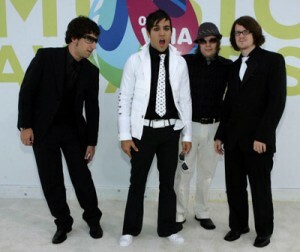 besides that everything is almost identiacal to the men’s skinny tie. Materials range from silk to exotic leathers. Colors vary from solid black to bright pink with stripes. 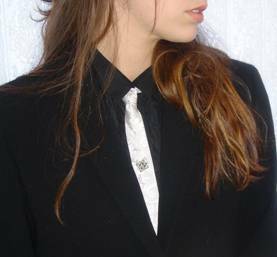 Skinny neckties on women: For 2008 many women’s fashion designers incorporate the skinny necktie.